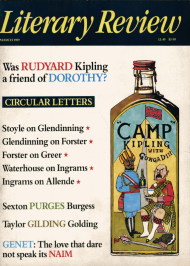 Rudyard Kipling was both a writer and an important public figure, as likely to be seen in the company of his friend King George V or speaking at a recruitment rally as among his fellow writers. During his lifetime – in progressive circles, at least–he came to be regarded as no more than a crude and vulgar Imperialist, a kind of literary Cecil Rhodes. But there was always more to him than that – as George Orwell made clear in a pioneering essay of 1941. Since Orwell’s time, there have been many reassessments and Kipling’s literary reputation now stands as high as it has ever done.